The Preferences dialog allows you to configure and customize App preferences. This screen allows you to configure general app preferences. 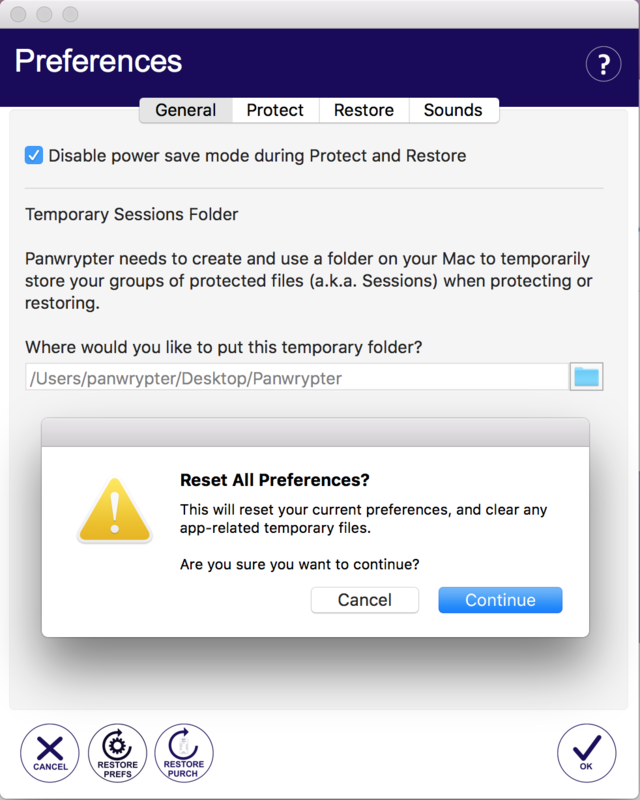 Enabling this option will prevent your Mac from going into power save mode while Panwrypter is protecting or restoring your files. 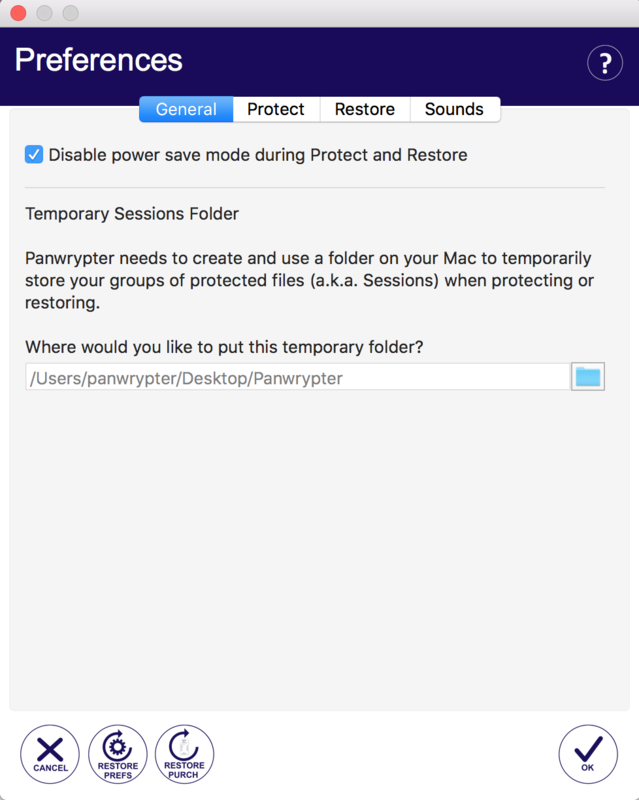 Panwrypter uses this folder on your Mac to temporarily store your protected files (protected sessions). When you protect files, it is used to temporarily store your protected volumes until they have been successfully transferred to their designated storage sites. When you collect your protected volumes back from their storage sites, the collected volumes are consolidated back into a protected session and stored in this folder, in preparation for restore. 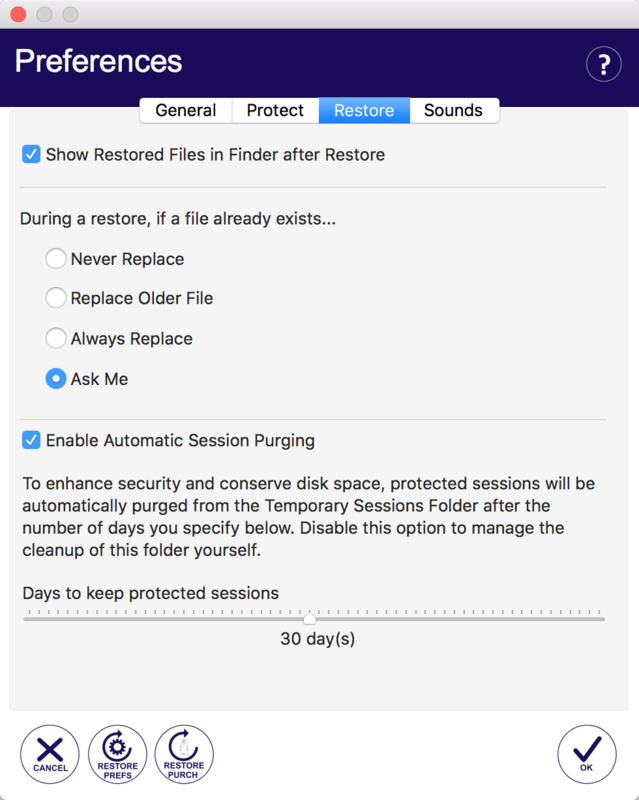 When you go to restore your files, the restore screen will show a list of all of the protected sessions in this temporary sessions folder. IMPORTANT: Following successful transfer or restore, and if you no longer need it, you should secure erase this copy of the protected session from your temporary sessions folder. This can be done using the "Secure Erase This Session" option in the "Restore screen". This screen allows you to configure preferences related to protecting files. Enabling this option will show the contents of your protected session in Finder, once the file protection is complete. Enabling this option will compress your files during protection, which can reduce the required storage space for the final protected volumes. Enabling this option will create a Session Manifest - a list of the files included in your protected session when you protect files. The session manifest is a simple text file that allows you to quickly view the list of files within a protected session. If you don't want the list of files within the protected session to be visible, then you should disable this option. If you have already created a protected session with a session manifest, you can erase the existing manifest using the "Secure Erase Session Manifest" option on the Restore screen. This option applies when you are using the automatic transfer feature. Enabling this option will verify the contents of each storage site folder, as it is transferred to it's final storage site location. 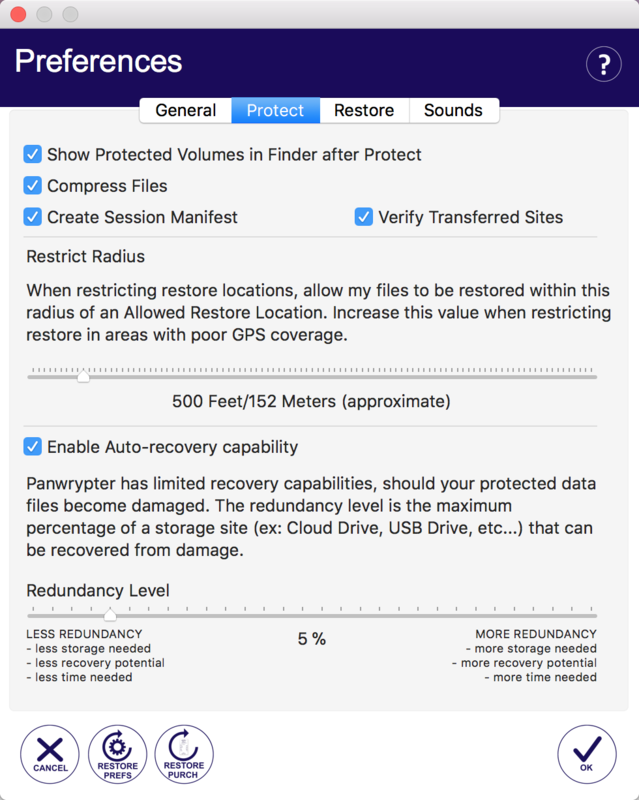 The "Restrict Radius" is a radius distance around an allowed restore location from where you will still be allowed to restore a protected session that has physical restore restrictions in place. Adjust the slider to increase or decrease this distance. This option is provided for people who need to protect and restore files in areas experiencing weak or inaccurate location services signals. Increase this value to make the restore authorization checking more forgiving when you are restoring your files. This option only affects the creation of new protected sessions, it does not affect or aid the restore of sessions that have already been created. IMPORTANT: After adjusting this setting, always perform a few test protect and restore exercises, before using it to protect your files. More on Troubleshooting Location Services Issues. Enabling this option will generate additional recovery data alongside each of the protected volumes within your protected session. In the event that one or more protected volumes becomes corrupted, and depending on how significant the damage is, the recovery data can be used to automatically recover your protected files. Below, you can also set the "Redundancy Level", which is the maximum percentage of a storage site that can be recovered in the event that it's protected session's become corrupted. IMPORTANT: Using a higher redundancy level, will increase the overall time it takes to protect your files. 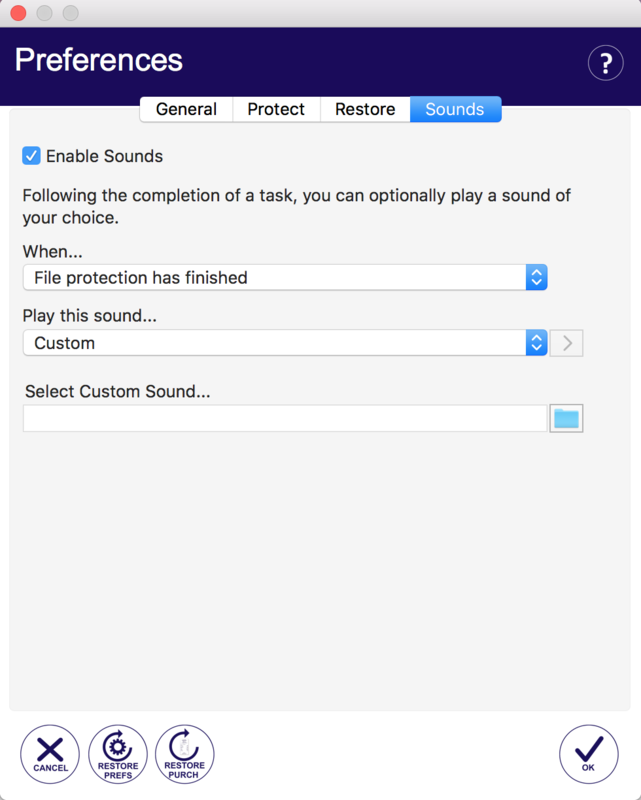 This screen allows you to configure preferences related to restoring protected files. Enabling this option will show your restored files in Finder, once the restore has completed. This series of options, allows you to specify what happens when restoring files over an existing file with the same name. This option will automatically purge protected sessions that are older than a specified number of days, from the Temporary Sessions Folder on your Mac. Use the slider to customize the number of days to keep your protected sessions. This screen allows you to configure pre-defined, or your own custom sounds for specific events that occur in Panwrypter. 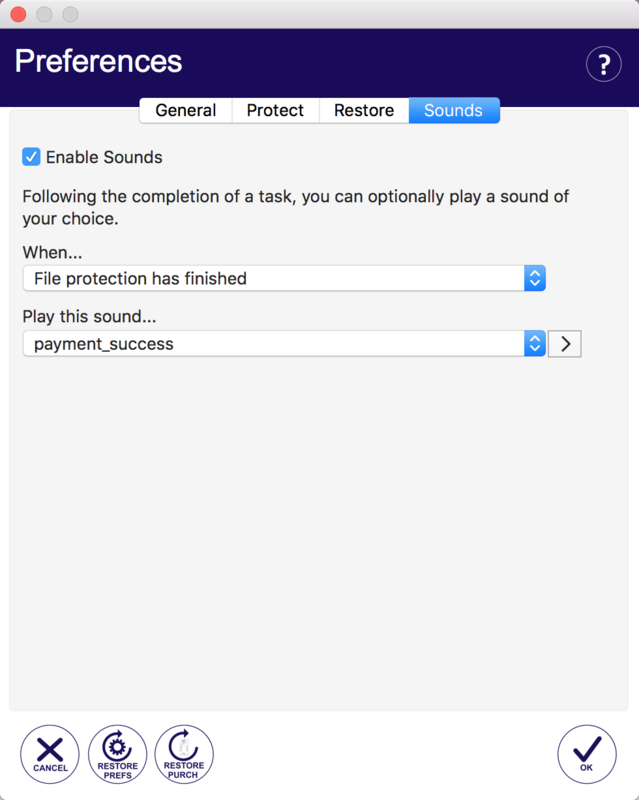 To disable all sounds in the App, uncheck the "Enable Sounds" checkbox. These notifications are useful if you are physically away from your Mac during a protect or restore, and need to know when the process has completed. Select the event in the App for which you want to assign a sound, using the "When..." popup menu. Select the sound that you want to play when that event occurs, using the "Play this sound..." popup menu. To configure a custom sound to play, simply select "Custom" from the "Play this sound..." popup menu. An additional field "Select Custom Sound..." will be displayed that allows you to select a custom sound from your Mac, and apply it to an event. The "Reset App Preferences" button in the lower left corner of the General tab allows you to reset all product-related preferences. Use this option if you want to reset all App preferences, or have been advised to do so by Tech Support. 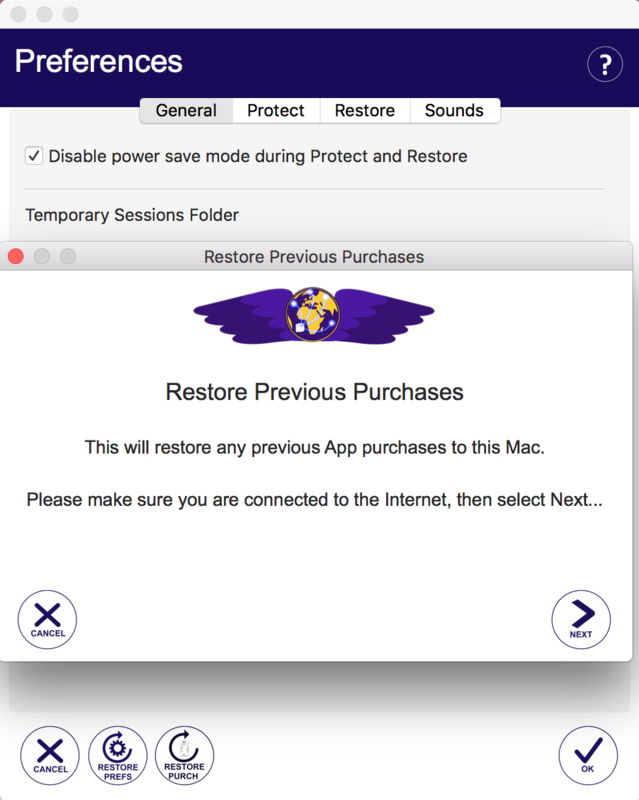 The "Restore Purchases" button in the lower left corner of the General tab allows you to restore all of your current Panwrypter App purchases from the Mac App Store. Use this option if you are installing/reinstalling Panwrypter onto a new Mac.